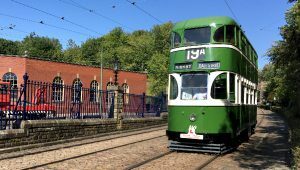 Crich Tramway Village is an attraction in the heart of Derbyshire which holds a national collection of vintage trams. 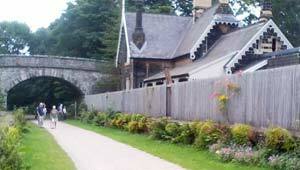 The museum has been constructed to create a village effect along a stretch of track which leads up a hill. 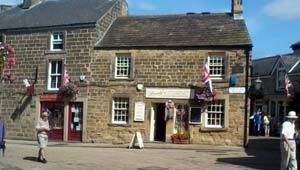 There is a village centre, complete with pub and shops, a bandstand area, a mining stop and a stop right at the top of the hill which has a walkway to the Crich Stand monument. 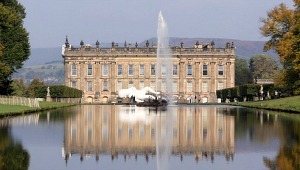 Chatsworth House in Derbyshire is one of Britain’s premier country houses. It has been home to 16 generations of the Cavendish family since the 1560s when the initial house was first completed. Today, the house, gardens and 1000 acre park surrounding them are a huge tourist attraction for the north of England with over a million visitors a year. 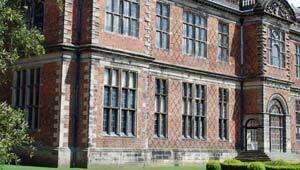 Sudbury Hall is a beautiful, brick-built stately home in Derbyshire, England which is operated as an attraction for visitors by the National Trust. 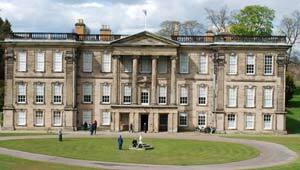 It was built in the 17th century for the Vernon family, who still live nearby, but was given to the trust 1967. We fell in love with this house, because it’s so pretty and unlike many of these country homes, it’s actually small enough to imagine yourself living there! Calke Abbey is a stately home in Derbyshire owned by the National Trust. 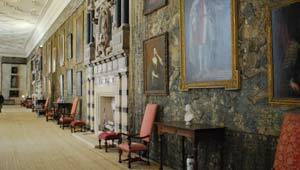 The trust’s website starts its description like this: “with peeling paintwork and overgrown courtyards, Calke Abbey tells the story of the dramatic decline of a country house estate.” This kind of sets the scene for your visit. Bakewell is a historic Derbyshire town made famous by its tasty pudding. It nestles in the Peak District, just a short drive from Chatsworth House with Matlock to the south and Buxton to the north. The arguments over who came up with Bakewell Pudding first still continue to this day and you’ll find several shops selling it around the town. The recipes do vary a little from shop to shop, but on the whole there’s not a vast amount of difference and they all have that lovely almond-based taste. Monsal Trail is a former railway line which has been turned into a leisure route for cyclists, horse riders and walkers. As a railway line, it was a stretch of the Midland Railway which closed in 1968 and ran from the historic Derbyshire town of Bakewell to Wyedale near Buxton. This Peak District route is made extra special by the bridges and tunnels that form part of it. They were restored at a cost of several million pounds to turn the route into a viable leisure path. Hardwick Hall is a National Trust Property nestled on a hillside near Chesterfield in North Derbyshire. You can spot it from the M1 heading out of Derbyshire into Sheffield. Bess of Hardwick first created Hardwick in the late 1500s and her stamp on the place is very much there to see with the décor displaying her initials everywhere. We’d describe it as a typical Elizabethan property, full of dark furniture, serious looking pictures and huge tapestries.